Skill, Employment and Entrepreneurship Department, Govt. 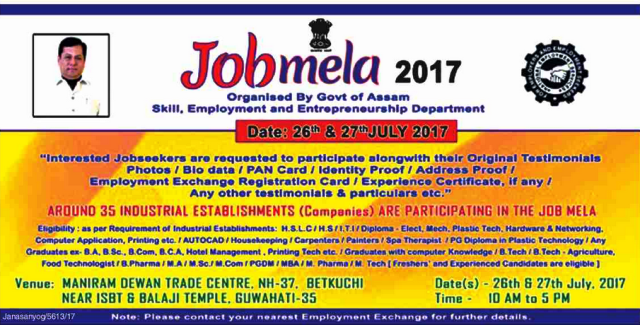 of Assam is organizing a JOB FAIR called "Job Mela 2017" at Maniram Dewan Trade Centre on 26th and 27th July. Interested Job seekers are requested to participate alongwith their Original Testimonials Photos/ Bio data/ PAN Card/ Identity Proof/ Address Proof/ Employment Exchange Registration Card/ Experience Certificate, if any/ any other testimonials & particulars etc. Date(s): 26th & 27th July, 2017, Time: 10 AM to 5 PM. NOTE: Please contact your nearest Employment Exchange for further details.